Over 18 years of tired and true. 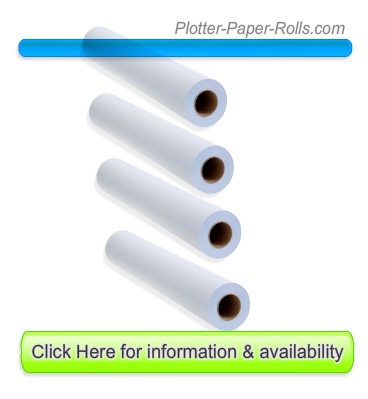 Plotter Paper Rolls recommended for Hp, Canon, Encad, and Epson and all identified 2 inch core Inkjet Wide format Printers Plotters. Brand New! FOUR rolls! 30 inch x 150 foot rolls of plotter paper! Engineered to be compatible with all wide format ink jet printers! Fits all plotters which accept 24 inch wide paper with 2 inch core, including most plotters from Calcomp, Encad, Epson, Hewlett Packard (HP), JDL, Kip, Oce, Roland, Xerox, and more! Get inkjet (2 inch core) plotter paper roll Great fit for 2 inch core roll printers that will make wide format printing crisp consistant in rolls or sheets inkjet bond. It is plotter paper 30 inches width is best to understand where the 30 in the small equaision 30 x 150 plotter means. To understand the terms of 30 x 150 plotter paper one would look over thier large format printer, identify the name and find it to be an inkjet modle (large format printer that uses ink - to squirt several inkjet streams from the large format printer to form an image, picture, line or from point A to point B image. IJ 30x150 20LB inkjet bond is this plotter paper; giving the plotter media experience solid highest quality inkjet bond paper roll also called inkjet bond 30 x 150 paper 20LB 30x150 inkjet plotter paper bond rolls. Yes, most often called rolls due to the way we have packed them over the years. Packed, plastic secured from moisture and the rigors of travel you will find each roll of 4 just as smooth and consistent as the one before it. You will see every best roll fill the right size as recommended by the owner's manual of your large printer. Rolled out by USA for large inkjet printers in America. The government size bond 20lb sets paper standard, therefore, American workers find American paper roll for their IPF Canon or Hp Designjet printer here. Standard sizes of today's wide roll plotter paper economy bond 30 x 500 paper fresh from the Mill boxed for you, to you, creating office supply bliss for the big jobs. I have seen it written as 30" x 150' 20 lb# Plotter Paper, (2" core) 4 rolls/case also 30" x 150' 20 lb paper roll or rolls to get best quality for best price gives America a good economy name. There is value plotter papers. Delivered as promised, rolls were packaged Very Well also wrapped in a THICK no moisture wrap... We could smell the fresh, No wrinkles on our last batch, now back for more. Recommend them, we did. We looked for economy from the mega store but it was this one that shipped the right size, the first time and quality was MUCH better - Free Shipping you cannot beat . Click the button below to add the 30" x 150' 20 LB Plotter Inkjet Bond (4) Rolls, 730305U to your wish list.